Planning a trip to Europe? If you’re wondering what to pack for a trip to Europe, this blog post dives into what I packed for our trip that somehow managed to fit into a carryon suitcase! Below you will find little tips and tricks I used to streamline packing and bring only what I truly needed for our trip to Europe. When I began to think about packing for a nearly two-week trip to Europe with my family a couple of weeks ago, I felt instantly overwhelmed. What was the weather like? Were my shoes comfortable enough for all that walking? And, more importantly, how was I going to cram everything into the required carry-on size suitcase? Advice from former travelers told me one thing… depend on cardigans, layering and accessories to change an outfit to avoid packing tons of different clothes. In the end, I repeated several clothing items, but felt like my outfits looked different enough every day. 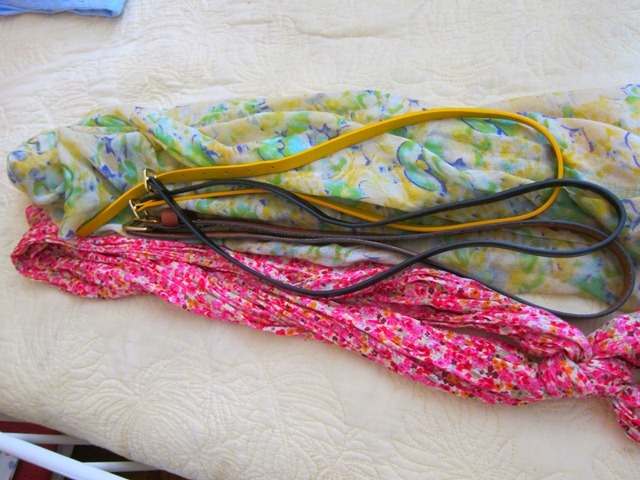 For our trip, I packed four different cardigans (one extra-long to be worn with leggings for travel), two colorful scarves and three different belts. I wore every single cardigan (often multiple times) and found them not only comfortable but also important to have on hand, as many of the churches and historical sights in Europe require that your shoulders be covered. I kept my jewelry relatively simple and packed bangles, three bracelets, two watches, two delicate necklaces and one long gold necklace (unpictured). I was also lucky in that I could borrow some accessories from my sister’s stash which helped me change things up a bit as well. 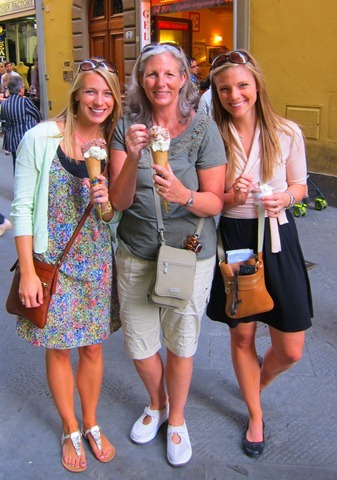 Cotton dresses were my go-to outfit on our vacation because they allowed for easy layering, were comfortable and didn’t have a waist band, which made them ideal for copious gelato consumption. 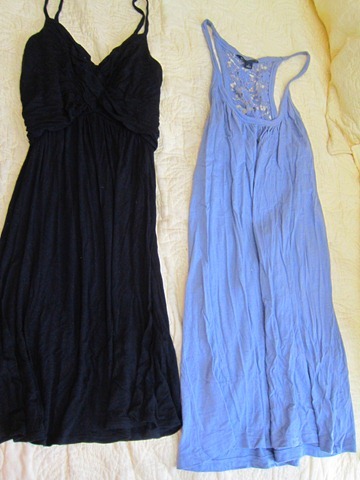 I packed two cotton dresses and bought one from H&M in Switzerland. I also packed one “dressier dress” that I never wore. Though Italy and (surprisingly) Switzerland were quite warm, Paris and London were significantly colder, making me very happy I packed some warmer clothes. 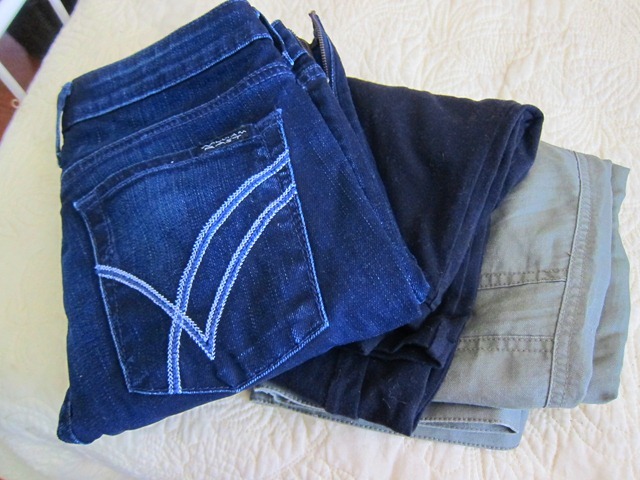 For pants, I packed a pair of comfy skinny jeans that were short enough to be worn with flats, a pair of leggings for travel and a pair of army green ankle pants. This worked well for me, but I was ready to burn those jeans when I got home from wearing them so often. Had it been colder in Italy, I definitely would’ve wanted another pair of pants on this trip. Now for warmer weather bottoms! 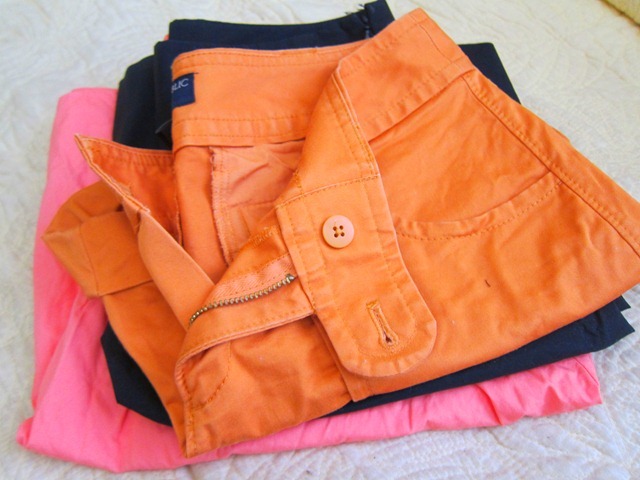 I packed one knee-length pink skirt, a high-waisted black skirt (that I never wore) and a pair of orange shorts. Though the knee-length skirt was a great decision, I wouldn’t pack the shorts again. 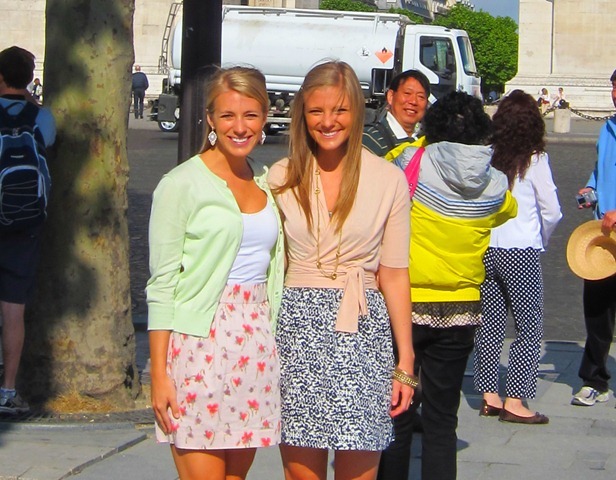 My sister and I wore shorts on the same day and we both felt like that was the only time we felt like we looked like tourists and a bit out of place. It felt like people were looking at our legs (not in a good way) and we just felt a bit uncomfortable. I packed two pairs of sandals (one gold and one brown), figuring I could wear the strappy gold sandals to a nicer restaurant if need be. 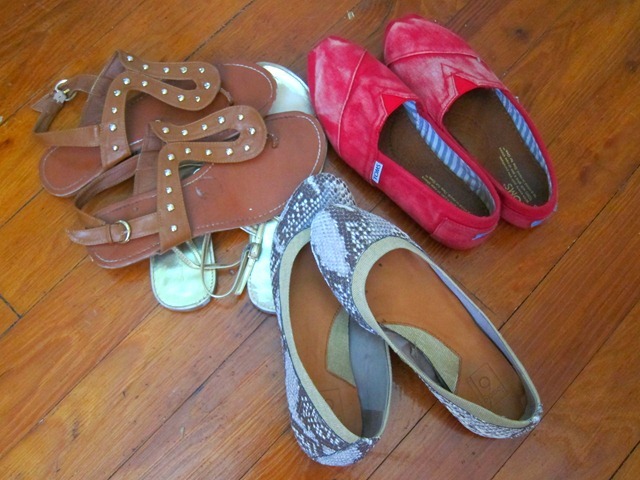 I also packed a pair of TOMS (SO comfy!) and a pair of black flats that I borrowed from my sister (I replaced them with a pair of my flats for the sake of the picture). I was advised not to pack gym shoes because no one in Europe walks around wearing Nikes, and that was very true! Since I didn’t plan on working out on my trip, I didn’t pack sneakers at all and was completely happy with that decision. Before leaving, I tested out my on a 3-mile walk to make sure they really would be comfortable for miles of walking. They definitely passed the test and I was glad to have them along on the trip. I packed three solid and neutral-colored tank tops which were fantastic for layering. 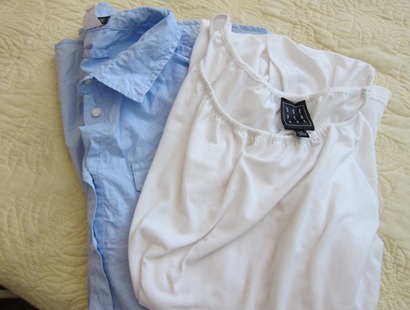 I also packed a comfortable long button-up blue shirt for traveling and a white shirt that could be worn two different ways for alternate looks. I made sure to pack three jackets – one fleece (you can’t go wrong with a quality North Face fleece), one lightweight jacket and one raincoat. Don’t forget the ! It was imperative for the dreary London weather and the material of a quality raincoat will also help with wind resistance. I used the exact same purse every single day. My crossbody bag (purchased on sale through RueLaLa) came in handy because it allowed me to have free hands and kept my belongings close to my body and in front of me which made me feel safe from the all-too-prominent pick-pocketers. 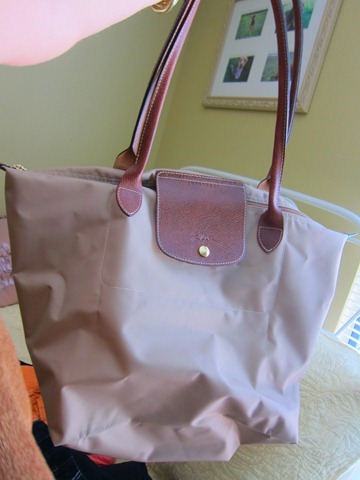 I also bought a large Longchamp bag before we left using some money I received for my birthday and was so glad I had it. The size was perfect and it ended up being an ideal travel bag. It held everything from my laptop and books to a sweater, wallet, camera and more. I highly recommend it! thank you for posting this 🙂 I am going on a Mediterranean cruise in a couple of weeks. Everyone in my group has been to europe before except me. and NO one can give me straight answers on what to pack! I have been trying to decide on shoes.. TOMS were one thing I wanted to buy but I didn’t know if they would be comfortable enough. Anyway.. Thanks for this post. So helpful! how fun! i hope you have a blast, lara! Love the pink wrap around cardigan, do you remember where you bought it? Just found this on Pinterest and it has been very helpful! Thank you! My husband and I are traveling to Europe in two weeks and I’m nervous about packing light! After reading your article, I’m eliminating my shorts and tennis shoes and adding a few more cardigans. What size is your Longchamp tote? Hi there – I stumbled across your blog just before leaving for Romania and Budapest for 2 weeks and you advice and pictures were invaluable! Thank you so much for the detailed descriptions and guidance you provide here – I definitely had a range of outfits perfect for 45 degF – 95deg F weather that fit in my backpack < 33 pounds! So thanks a bunch! 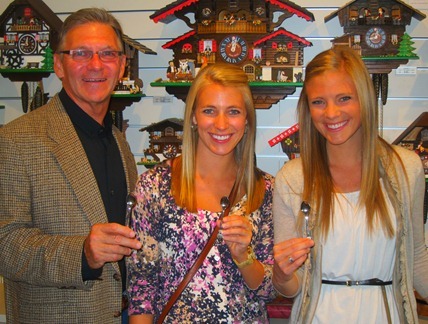 What company did your company tour with? I know this blog isn’t too recent, but I’m glad I stumbled upon it! I’m going to germany/france in two weeks, and I will definitely be utilizing your advice! 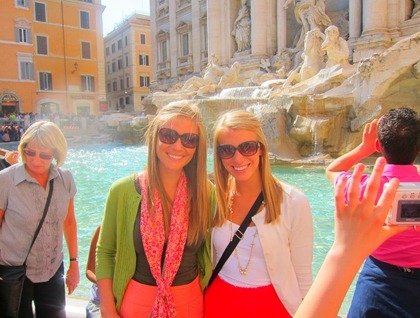 Especially about the tennis shoes part, i’d rather not be pick pocketed just for looking like a tourist. Thanks! I am so happy to have found this! I’m headed to Europe for the first time this summer! I’m definitely using your list as a guide. Thank you! Thank you so much for the post! I’m going to Italy and France for two weeks this summer and feel much better about packing. I was wondering about your footwear. Were your sandals comfortable? I’ve been researching sandals to wear but a lot of sightseeing, but they are all bulky (and well, pretty ugly). Any thoughts would be wonderful. Thanks! If you haven’t gone yet, try Reef sandals. They have arch support! Were your feet okay in the flat t strap sandals? Those are my go-to shoes but I thought I might not be able to wear them walking all day long! Oh my gosh, thanks for writing this. My husband and I are going to Europe for two weeks and I’ve been totally been stressing about packing. I am a horrible packer. So I was absolutely thrilled to read this. Thank you, thank you, thank you. I have the same pair of Toms that you do, and I wore them throughout a 21 day journey through Europe (including Greece). 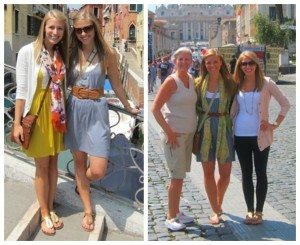 I found they were so comfortable even on cobblestone streets! I switched up between those and my Converse tennis shoes. I liked the Toms better! Where did you get your brown studded sandals? I had a pair like them a few years ago but I haven’t been able to find that style since! i will be visiting europe at the end of may and early june, but ofcourse northern europe like Germany, london, Belguim, etc. And im visiting for 2 weeks. This was very helpful! i appreciate you making this page! THANK YOU for this post! Your ideas are perfect – casual, elegant, and completely sensible. 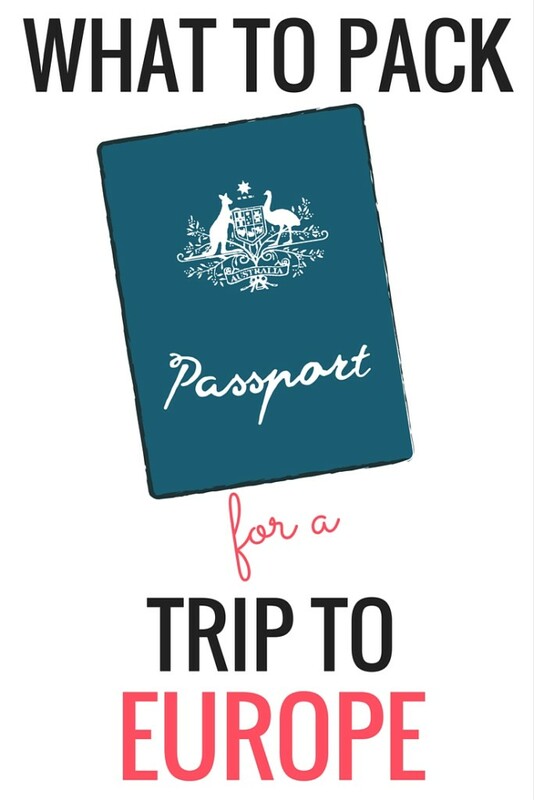 I’ve been scouring the web trying to figure out what to pack for my upcoming 2 week trip to Europe and I am so glad I found your site! You have a great style and good advice. Europe weather is changeable. The south is warm, hot in summer and the north rainy and cloudy but also therefor very green :). Hope you liked your trip. Good luck traveling. So glad I stumbled upon this on Pinterest! I’m getting ready to study abroad in Spain for 5 weeks, followed by 2 weeks of independent travel around France and Italy. Your list is great because it’s specific and has pictures of the different stylings!!! Thank you so much for sharing! 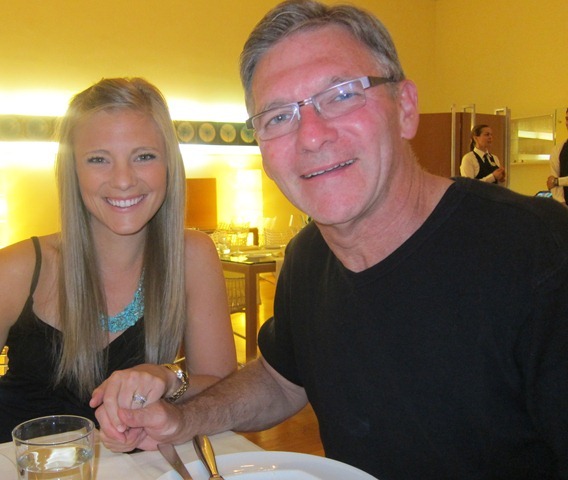 I am so glad that I found your blog! 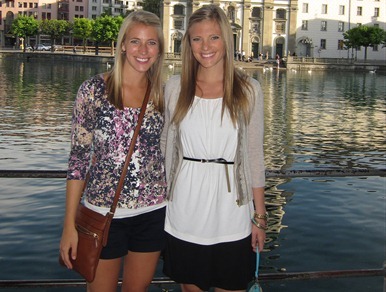 My daughter is traveling to Europe in two weeks and I have been searching the internet for useful advice about what to pack for YOUNG people. The pictures are terrific and this is by far, the MOST helpful method for conveying information I have seen so far! Thanks and keep up the great blog! Hello, in two weeks I’m off to Europe and I’m super excited but I was wondering if sandals are still comfy after 3+ miles of walking? I’m not too into the idea of wearing sneakers the entire time, so would sandals be a viable option? 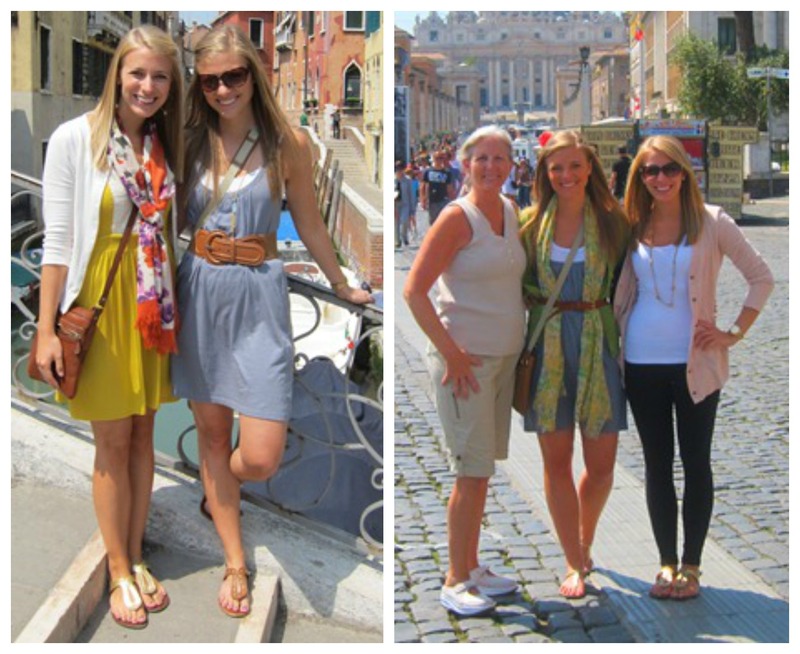 I was just in Europe for 2.5 weeks and would have been lost without my Merrell Barefoot Mary Janes. Kind of a cross between a sandal and sneaker. Absolutely comfortable, breathable, and even washable! Plus, they’re really cute. I have two pairs that I purchased at DSW on the clearance rack (! 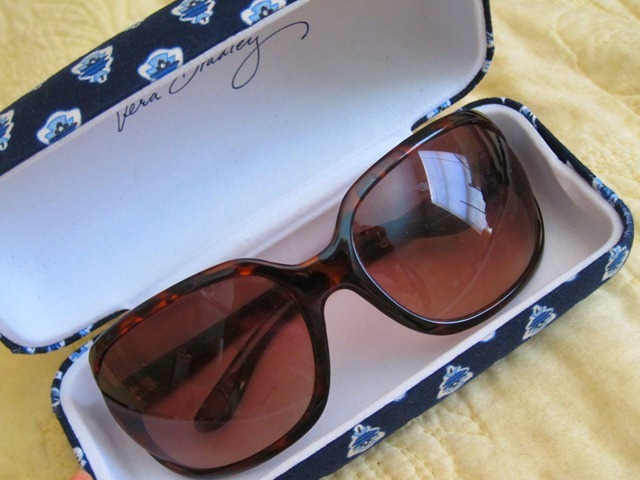 ), but I also found them on this website just now in case you want to take a look: http://www.qvc.com/.product.A215756.html. Thank you Danielle for your trip ideas! I leave for Europe soon and found your information really useful. 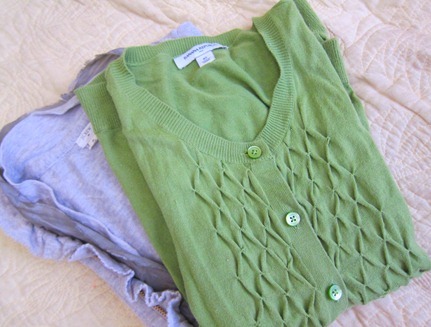 i think i will plan to bring more cardigans for those cooler days. I think we are doing the identical trip as your family. Your website is going to help me in a big way!! 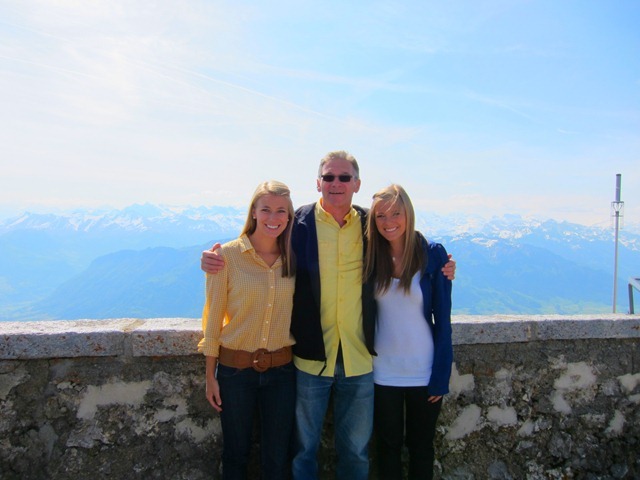 Did you do any hiking in Switzerland? If so, what shoes did you wear, assuming Toms, and were they adequate? My husband & I are going for 10th Anniversary to Paris in Sept. After reading your blog , I know I’m taking my tan long cashmere cardi (especially for travel) and a cute black. Silk Maggaschoni cardi with ruffles down the front. I’m thinking of taking my black patent fleece lined rain shoes and steel gray Stewart Weitzman snake print ballet flats. I also have a couple of pairs of Cole Haan mules w/Nike technology. I can walk forever in them. you eat less and exercise more. with the abrasive action of the salt will remove stains effectively. Do you remember where you bought your dresses? I LOVE that white shirt – am I correct that you also put it over the dress in the first couple of pics? remember where you got it from? I can’t quite read the tag. Thanks! Where did you get your suitcase? 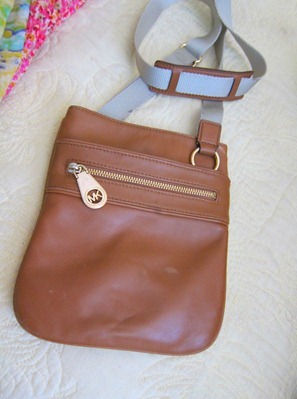 I need a new one for my trip to Paris next month and it is so cute and different! 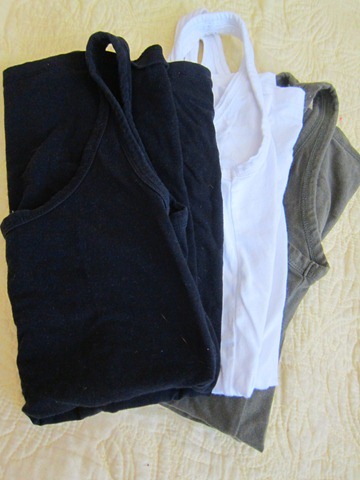 Hi Julie…What brand or store are your three neutral tank tops from Europe packing list? They look comfy & stylish. Forever 21, actually! 🙂 I got them years ago though. Thanks for the great list! I think I’m sorted for a 3 week trip around Italy and France. I’m trying to find tips on what men should pack on a European holiday. I’m worried my husband will always look like he’s going to the gym. So i know i am a few years late.. haha but, i have a question about outlet converters. Did you use the same converter for each country? I’ve looked online and apparently there are different outlets in different countries. Can you link me a picture of the one you used, or one similar? What month/date did you travel to Europe? I appreciate your attention to detail in this post, but would like to see how it lines up with the time I will be traveling so I can decide if I need to change anything for warmer or colder temps. We are traveling the end of May and early June to Venice, Rome and Lake Como. Thanks! Found this on Pinterest. Fantastic tips! Thanks so much for sharing!! Hi! Found this post via pinterest a bit later but so glad! I just love all your Vera Bradley I keep finding on various posts. I have one, possibly odd question…hopefully the first time you’ve heard it! What material are your leggings? I have various types and none seem comfortable enough to rock in the warmer climates. we are about to travel in a multi-climate area where we will need to be fast and functional in the changes from the beginning of one day to the end. So far all my leggings make me want to itch my legs to pieces in 70 degree weather! Tips on materials are greatly appreciated! I really like JCrew signature leggings, great all weather/year round leggings. Thick enough to cover yet breathable in summer. Wash well too. They go on sale pretty often. I try to stock up when they run a 20%-30% off code at the same time. I love how you paired the white shirt over the black dress!! I am currently planning a trip to Europe for this upcoming fall, so these outfit ideas are super helpful to look at again. I recently returned from a 3 plus week spring trip to Europe that included The Netherlands, Belgium, Luxembourg, southern France and Paris. I fully agree with your jeans comment. I also wanted to burn my jeans once I returned home, as I had worn them SO many times. For people following your advice, I fully agree with your travel list. I would also leave the shorts home. I would wear a pair of jeans on the plane and pack another pair. I wore mine regularly. I would also not worry about athletic shoes, if they are your comfort shoes, take/wear them. Many days we walked up to 6-8 miles. Your feet need to be pampered. Also, much of the information out there indicates that Europe is more dressy than North America, and indicates that you should take dressier clothes and shoes. I disagree. Our experience didn’t prove this theory. Take your favourite clothes, those that make you feel great. That’s the right approach. 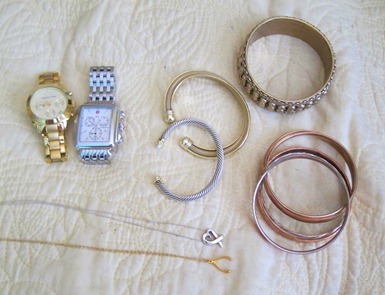 You will see many women in a nice shirt, jeans and a scarf – accessorized by statement jewellery. Great look for anywhere in the world. Don’t overpack, but take what you need. And YES!!!! take your own shampoo and conditioner. The hotels often only supply a two in one. Not OK.
All that aside, my one hint for travellers, if you want to share your adventures with those at home…think about a wifi capable camera. Great for direct posting to Facebook! Have fun. This post was INCREDIBLY helpful, as I am panicking about what to pack for a 10 day trip to Switzerland, Paris and wherever my husband wants to venture. SO, so helpful, especially with all of the pictures! Thank you!! 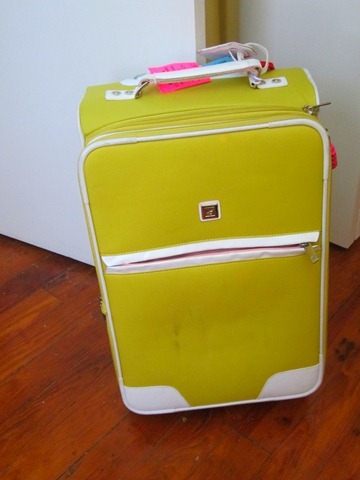 Best blog I have read on packing only a carry on bag! Well done. I now feel prepared to pack for my 2 week trip to the USA!! !